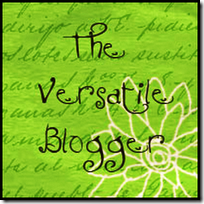 Versatile Blogger Award by the ladies at A Love Affair With Books! Thank you Jennifer, Trinity and Desiree!!! You guys rock! I’m a complete and total perfectionist… to a fault. And the worst part is that I passed it on to both of my kids! Arg! Almost a year ago, I decided enough was enough and I started working out 6 days a week and eating healthier. I’ve lost 45 pounds in the last 10 months! Woo-hoo! I drink lots of coffee and lots of wine. Lots! And I love them both! There’s nothing like holding a glass of wine or a hot cup of coffee to calm down this overly tired, full-time working mom and blogger. I married my high school sweetheart, and even at age 34 right now, we’ve been together for 18 years already! Can’t imagine life without him or our two boys! I have the best friends a girl could ask for… they are so supportive of me and everything I do that I think they believe in me more than I do myself! Those are the keepers! And to top it all off, I’ve met some amazing friends in this community already and can’t believe how lucky I am to know such great people! 10 awesome bloggers we would like to nominate and that you should check out!